Road tax evasion falls | What Car? Road tax evasion has fallen by 40%, according to statistics released by the Department for Transport (DfT). The DfT revealed that just 1% of vehicles are not licensed, compared with 1.7% in 2007. 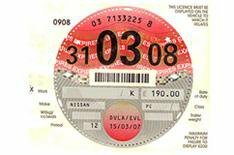 The Driver and Vehicle Licensing Agency (DVLA) collected 99.1% of all potential revenue from road tax during 2008. Transport minister Jim Fitzpatrick said: 'I am delighted that we have seen such a significant fall in the level of road tax evasion, but we aren't complacent and will continue to take action against those who fail to license their vehicles.